The Woolf Fisher Research Centre at the University of Auckland, led by Dr Stuart McNaughton, is currently carrying out research to find out how we teach 21st century skills, such as critical thinking, self-regulation and collaborative reasoning, using digital technologies. As part of this research, Room 9 @ Pt England were observed by a member of the Woolf Fisher team yesterday. My focus during this observation was the teaching of prosocial skills in a digital world by integrating Cybersmart learning and the key competency of relating to others. As a hook to engage the learners in a fun and positive way, I chose a movie created by Room 18 @ Pt England for this year's Manaiakalani Film Festival, Make Kindness Go Viral! My lesson plan involved learners using positive words and their manners to find a buddy so that they were able to interact and take turns in a conversation as they brainstormed ideas and relevant vocabulary. Following our Think, Pair, Share brainstorm for the whole class, each student accessed the digital resources by making a personal copy of this DLO. Overall, this Cybersmart lesson was highly effective in promoting positive social skills and relationships between the students, while making deliberate and specific connections to the positive communications they create when crafting quality blog comments as part of the Cybersmart programme. It was also fantastic to listen to and read the rich language that was selected to create these comments. 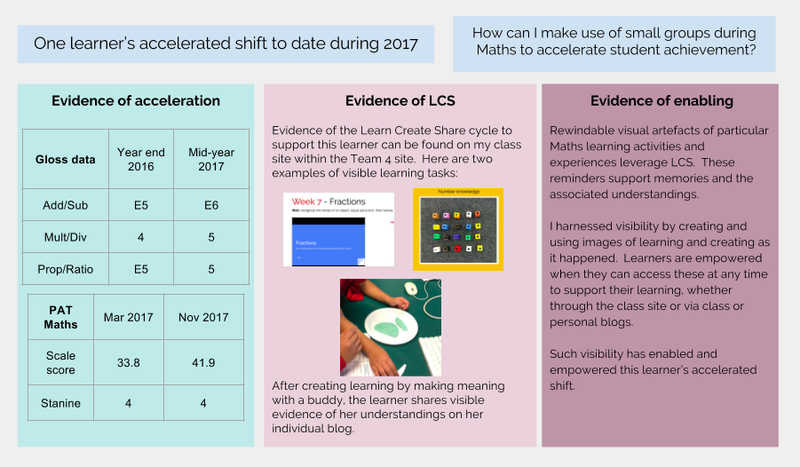 During 2017 I have been inquiring into how I can make use of small group teaching and learning to accelerate shift in Mathematics. 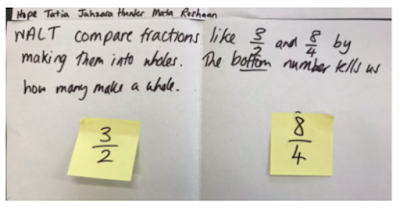 To meet this focus, teaching and learning of Maths in Room 9 this year has been predominantly achieved through 33 students being organised into four levelled groups (which have been reorganised during the year based on ongoing assessment). My initial target group was selected from amongst those learners who were Well Below National Standard based on assessment data from the end of Year 4. Mid-year data determined that nine students were working towards the National Standard expected at the end of Year 5 while 24 students were working Well Below the National Standard expected at the end of Year 5. Based on this data and following discussions with colleagues, my target group was changed to focus on those nine students who were working towards National Standard. However, one learner left Pt England early in Term 4; there is no comparative data for one learner who arrived at Pt England during Term 1. During the year there has been a strong focus on number knowledge and basic facts through daily online Maths activities (Xtra Maths and Maths Whizz) and teacher-created resources to support number knowledge acquisition, both digital and physical resources. The rationale is a bit like the chicken and egg scenario: what came first? How can learners move from skip-counting or repeated addition to using times table knowledge to solve multiplication problems if they don’t know their times tables? It is tricky for learners to make that shift from Stage 4 to E5 (which they are expected to achieve after being at school for three years) until multiplicative thinking is used. Students are expected to be working at Stage E6 of the Numeracy Project by the end of Year 5. Some learners don’t see the need to learn their times tables and, consequently develop their multiplicative thinking, as they see themselves as managing quite happily with skip-counting. From my observations and data, these target students know a greater range of times tables with confidence and are beginning to use this knowledge to solve problems. Outside my target group, some students find it difficult to work and learn independently to complete follow-up tasks. Literacy is a barrier to learning Maths for some: some learners need support to complete independent follow-up tasks. 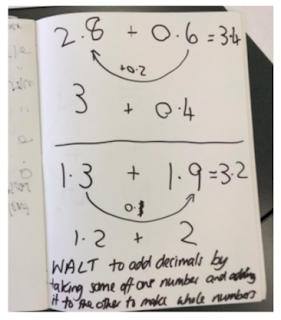 Literacy is also a barrier to completing PAT standardised Maths testing: students can pick out the numerals/numbers but don’t necessarily understand the problem to know how they should manipulate the numbers. The Key Competencies of Managing Self and Relating to Others play a major part in teaching and learning. It is challenging for a group to function cohesively if learners are still learning to manage themselves to listen, respond appropriately and take turns when sharing ideas and materials. Two of my target group of seven are at the National Standard expected at the end of Year 5. The difference in PAT scale score from the beginning of 2017 to year-end 2017 is consistent with the progress made in Maths based on GLOSS data. Some small shifts of accelerated achievement across the three domains are evident from GLOSS assessment data. A teaching-learning balance between number knowledge and strategy was achieved during the year. All of the target group have improved their times table number knowledge significantly and are beginning to make connections between times tables and problem-solving. Having looked closely at the data as we conclude the year, I feel disappointed that more steps were not climbed towards the top of the hill. I have been reminded that learning is not a consistent upward trend towards the top of the hill: students learn and consolidate understandings at their own pace and in their own way; life events and attitude to learning impact achievement. I am beginning to wonder if Maths succumbs to a summer drop-off as can happen in reading. 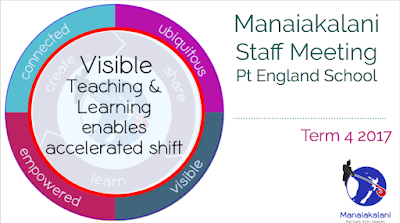 I believe there is much more to explore and inquire into in order to accelerate and sustain achievement in Maths and I am looking forward to inquiring into this further as part of the Manaiakalani Innovative Teacher initiative during 2018. During Terms 3 and 4 I was lucky enough to attend the Ministry of Education funded Incredible Teachers programme. 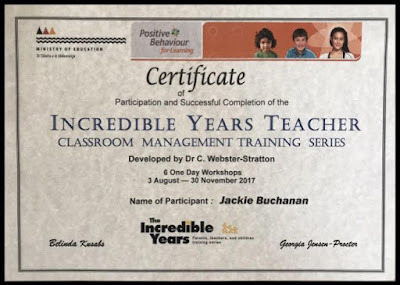 This professional development is offered over six days and provides teachers with opportunities to explore Dr Carolyn Webster-Stratton's strategies and techniques to nurture children's social, emotional and academic competence based on her extensive research. While building positive relationships with both students and whānau, and modelling empathy and appropriate and acceptable social skills would seem a normal part of a teacher's toolbox, the tools recommended to manage student misbehaviours were enlightening: planned and purposeful ignoring; redirecting; natural and logical consequences; incentives to strengthen positive behaviour; the development of individual behaviour plans. The key seems to be how we decide to respond to what we notice: making praise and encouragement the driver or catalyst for growing positive behaviour. Since starting the programme, I am consciously using more proximity praise and non-contingent praise, while I am becoming more comfortable talking away to myself by articulating my thinking as descriptive commenting. By being gifted this time to reflect on how I behave and manage things, both large and small, I have already reaped some small benefits for the whole of Room 9 by choosing to ignore some serial interrupters for longer than was usual! At Pt England's Manaiakalani Staff Meeting this afternoon, we were urged by Dorothy Burt to celebrate the accelerated shift of one learner. As we approach the end of the year, it is timely to reflect on the visibility of our teaching and learning and the part this played in achieving that accelerated shift. Maths Professional Development at Pt England is being supported this year by Jo Knox of Maths Development. During the year so far we have enjoyed rich discussions about the process of making Overall Teacher Judgments and the sources of information and assessment tools available to support us in robust decision-making. This week our team was given the opportunity to observe Jo’s practical expertise as she modelled a fractions lesson for students at Stage E5 and another for students at Stage E6. The purpose was to challenge ourselves to find ways in which we can apply her knowledge and wisdom to remove potential barriers and accelerate the achievement of the Year 5 and 6 learners in our shared learning spaces. Each of Jo’s lessons began with diagnostic snapshots to check current knowledge and conceptual understandings, before smoothly flowing towards new learning through manipulation of materials, imaging and number properties. It was interesting to note that Jo only explicitly shared the learning intention of her lessons during the conclusion of the session when she stated the mathematical concept in general terms. 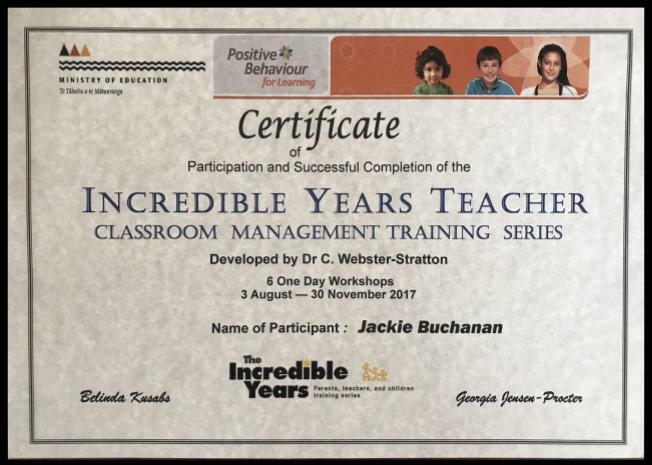 The consistency of Jo’s language and questioning when interacting with the learners through the flow of her lessons made the biggest impression on me during the modelled sessions. The use of the talk moves and wait time made her expectations very clear to the learners that everyone was required to think and then talk about the Maths problems before them. The focus was very quickly on Maths vocabulary, manipulating materials and explanations in a positive and respectful group setting. “Okay. And open. What number have I made? 2.8 Bingo! What will I need to make it? Finally, it was fascinating to observe the ease with which learners were able to make connections to their prior knowledge about our place value system and addition strategies to begin adding decimal fractions when using different materials, namely decipipes. I really did feel that they were able to visualize the decipipes and the motion of sliding tenths onto a threading stick to create a whole number. As I reflect on my Maths programme following this observation, there are definitely opportunities for me to adjust aspects of my Maths teaching and learning to incorporate Jo’s key points with the goal of better supporting the identified needs of my Maths learners. Reflecting on inquiry and practice often creates internal tension: What am I doing that is making a difference? What is important? Am I doing enough for my learners? What went well today? How can I improve that tomorrow? What can I do to promote learner agency? How can I tighten routines in the learning space? After the self-talk and deliberations, it was refreshing to listen to colleagues as they presented their latest Teaching As Inquiry reflections. How similar many of the challenges we face: development of oral language to express mathematical concepts, supporting reading to enable comprehension of written maths problems, enabling learners to make that shift from additive thinking and skip-counting to multiplicative thinking. Overall, what a powerful and positive way to take time to stop, smell the roses and count our blessings - the baby steps we are taking. Teaching As Inquiry 2017: what have I noticed? Today we each shared our latest Teaching as Inquiry wonderings and reflections within collaborative groups. It was empowering to listen to Pt England's CoL teachers provide an insight into their hypotheses, hunches and thinking as part of Collaborative Inquiry Meeting #5. Such sharing has gifted me the knowledge that I face many of the same teaching and learning challenges and opportunities in Maths as other teachers at Pt England - and that all opportunities to collaborate further to unpack and explore would benefit all of our learners. It particularly resonated when Rob Wiseman commented that students do not always demonstrate that they have fully understood a new concept or strategy when completing follow-up tasks independently. When learning strategies to solve number problems within levelled ability groupings, I have also noticed that students are mostly able to explain clearly how they have used an efficient strategy to solve a particular problem. They are able to do this using materials and appropriate language based on our learning intention and seem ready to move off and complete follow-up tasks independently. However, their full grasp of the strategy is not always evident in their completed follow-up tasks. How can I do my best to provide students opportunities to create their own meaning in order to enhance their mathematical understandings? 1. Create rewindable opportunities for learning. Dorothy Burt recently shared her wisdom that creativity empowers learning with Pt England staff. A next step for my inquiry and my target learners is to plan for them to be creative, to make their own meaning using a SISOMO approach to explaining their problem-solving strategy and mathematical thinking. My hunch is that the benefits will be twofold. Those learners creating a screencast or video will affirm their own mathematical thinking. 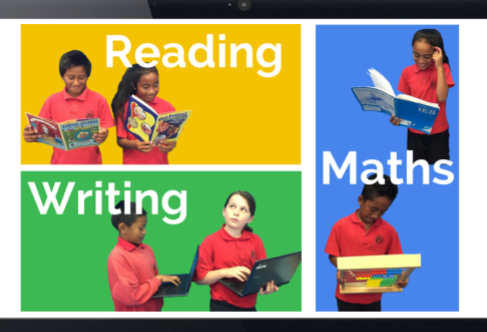 Their peers will have access to authentic rewindable resources to support learning any time, any place, anywhere. 2. 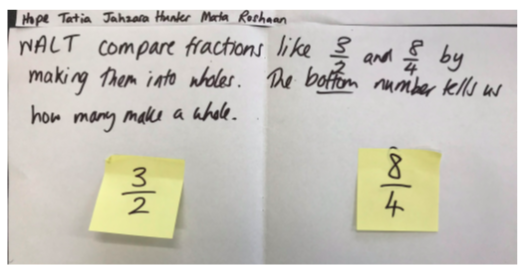 Teaching and learning using rich, worthwhile Maths tasks. 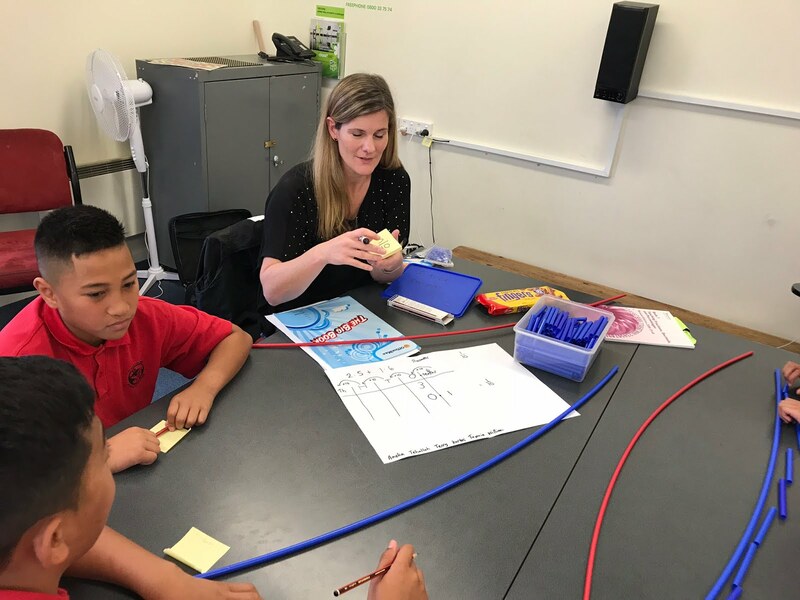 At our most recent Maths PD session with Jo Knox, she gave us practical advice about integrating Number and Strand in a fun and collaborative way using the NZ Maths unit, Giant Mystery. As well as planning opportunities for creativity, it is time for a rethink about the types of learning tasks used for teaching and learning within my Maths groups. By providing groups of learners with rich, open-ended tasks in a collaborative setting, will they be able to make their own meaning and retain those conceptual understandings? To begin to answer this question, I will need to reflect upon how I organise my Maths groupings and the flow of a typical Maths session. As well as being a positive mantra containing valuable messages for all our learners, I believe these messages are pertinent for me as a teacher too. Am I doing my best? Do I encourage learners to try their best? We are halfway through our school year and it is time to reflect on the cycle of teaching and learning in Room 9, with particular reference to my Maths target learners. My seven target learners have made mixed progress during the first half of the year. Do I continue to focus on these learners? 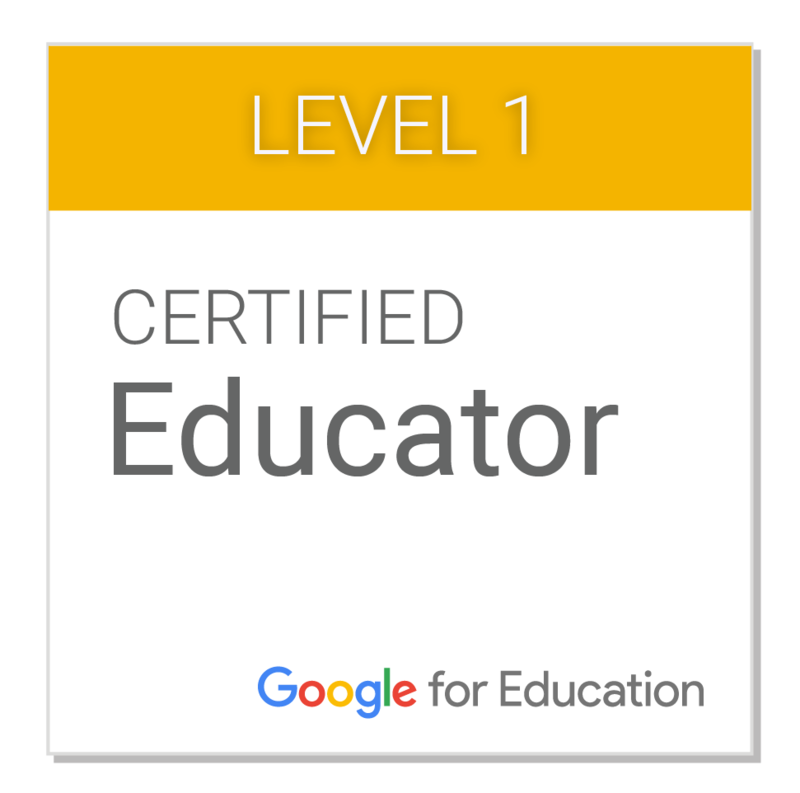 Based on what I know now (after six months of building relationships, knowledge of my learners and knowledge of their learning), do I need to adjust my group of target learners to try my best to make a difference for others? Looking at my Maths class overall, there are 33 learners: 9 are working towards the National Standard expected at the end of Year 5; and 24 are working well below the National Standard expected at the end of Year 5. I have reorganised my Maths groups to accommodate individual learner needs based on achievement during Terms 1 and 2. Coincidentally, within these new groupings, the social dynamics have changed and there is early evidence that learners are becoming confident to communicate with and learn alongside a range of other learners. So, where does this leave my target learners? Who are my priorities if I am trying to accelerate the achievement of 33 learners so that they are closer to working at National Standard at the end of Year 5? 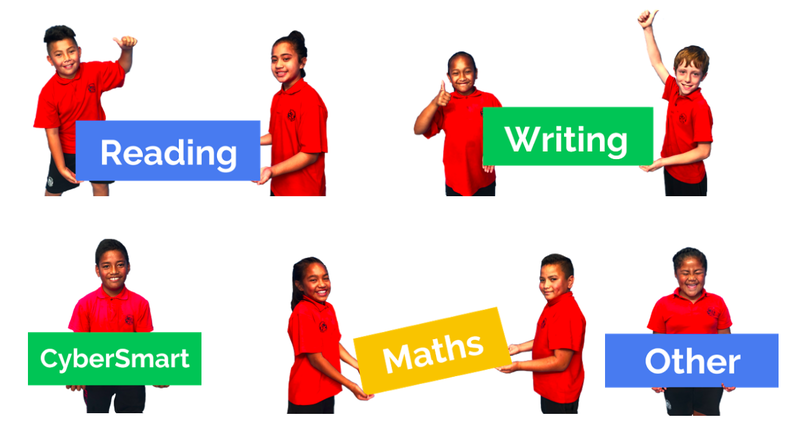 After much pondering and wondering, I have identified those nine students who are currently working towards National Standard at the end of Year 5 as my target learners for the remainder of the year. My reasoning: by attacking and filling identified learning gaps, building number knowledge and explicitly teaching strategies to solve multiplication and proportion/ratio problems, can these target learners move closer to working at National Standard by the end of Year 5? As these nine learners form one Maths group, my next step is to identify their learning gaps, particularly in Geometry & Measurement and Statistics, to support them as a group to become well-rounded and confident Year 5 mathematicians. 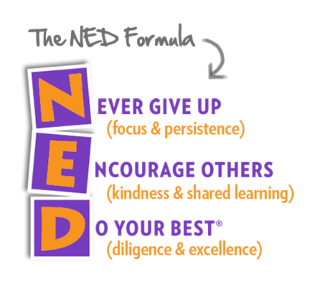 In order for me to do my best with focus and persistence, I think it’s time to go and buy a NED yo-yo! The wonderful Dorothy Burt shared her expertise with Pt England staff today to remind us how students are empowered and their learning enhanced through planned opportunities for creativity. She was emphatic that "create" is not completing a writing task that forms part of "learn". Creativity is about learners using sight, sound and motion (SISOMO) to embed and share their understandings about what they are learning or have learnt. In novel ways to suit the task, students are thus able to show that they are "creators of content, not merely consumers". It was remarkable viewing how learners at Pt England have been given multiple opportunities to create such novel content over many years. It was inspiring connecting with other educators at GEGNZ Auckland's annual SparkShop yesterday: How are educators flipping the classroom? How does Google classroom support this? What opportunities to use VR in the classroom? So much learning through play with Google cardboard and Youtube 360! A term into my inquiry for 2017, my thinking and reflections about this inquiry are presented here as planning for teaching and learning in Maths during Term 2 commences. 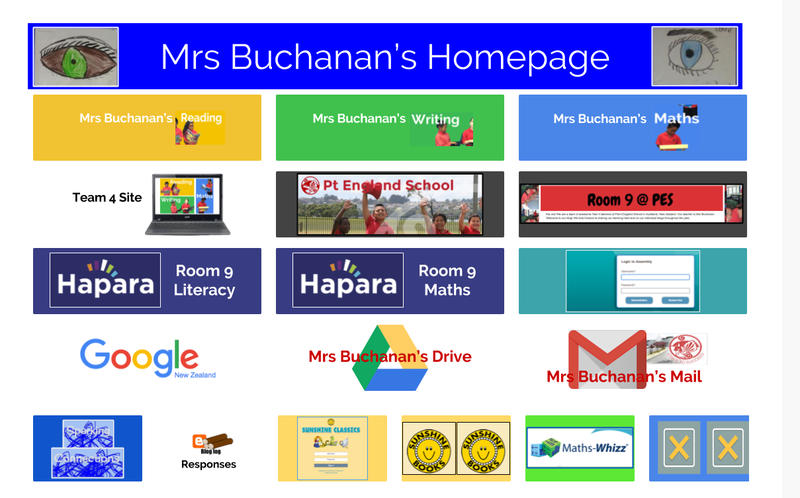 Following some wise words from Matt Goodwin at a weekly Team 4 @ PES meeting, I had some fun creating a personalised homepage to learn a little more about using HTML within Google Sites and to make my day-to-day digital life so much more efficient. In order for young people to become confident, connected, actively-involved lifelong learners, every child needs a positive attitude and growth mindset towards Maths and their own ability to solve everyday Maths problems by manipulating numbers. During 2017, I am inquiring into how I can make use of small group teaching and learning during Maths to accelerate student achievement in Maths. A target group of learners who were below or well below National Standard in Mathematics at the end of 2016 have been selected for this purpose. Within this context, how will I organise learning experiences and follow-up activities to support the acquisition of number knowledge and use of different strategies by these learners so that they are able to begin solving problems demonstrating part-whole and multiplicative thinking? As our new school year has begun with students heading into new learning in new environments, some questions remained about the reading habits and opportunities over the summer break for Room 10 @ Ruapotaka 2016 for my Spark-MIT inquiry. How much reading was undertaken over the holidays? Did students participate in the Summer Learning Journey? What levels of engagement were evident? What has been the impact on reading achievement? How were whānau engaged in supporting reading over the summer? By December 2016, 15 learners remained in Room 10’s control group for this inquiry. 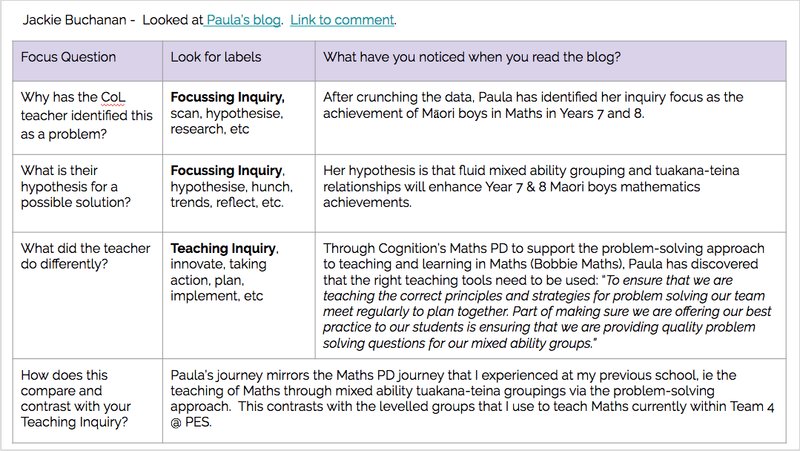 Of these, four actively participated in Manaiakalani’s holiday blogging programme, the Summer Learning Journey: two learners published 20 posts each; one learner shared 18 posts; and the fourth student published seven posts. Three of these learners had access to the internet and a digital device at home while one learner visited the public library to complete all blogging activities. It should be noted that there were barriers to student participation in the Summer Learning Journey as all student chromebooks were kept at school over the summer. Also, anecdotal evidence from students suggests that a number of families and whānau who actively support their children’s learning do not permit them to visit public libraries in the area to use the computer facilities for blogging or reading as they are viewed in a negative light. On returning to Ruapotaka in February 2017, the Room 10 2016 control group was reduced further to 10: three students had moved to other schools and two students remained on holiday in Week 2 2017. Three of these five students were active bloggers on the Summer Learning Journey but were not available for reading assessments. Of the students assessed in February 2017, Student A’s reading level increased by six months between November 2016 and February 2017. He was an active participant in the Summer Learning Journey and engaged with digital texts at home online throughout the summer. He made accelerated gains in reading between November 2015 and November 2016 and these were extended to a reading age of 10.5-11.5 during the 2017 summer holiday. Student B’s whānau values reading and there is a collection of books to read at home. Student B read these “a couple of times a week” during the holidays but had no access to the internet or a digital device, nor was he allowed to go to the library. Student B reads above his chronological age and maintained his reading age of 11-12 from November 2016 to February 2017. Three students read books occasionally over the summer, either at home or at the library, and the reading age of all three declined by six months between November 2016 and February 2017. Two further students did no reading at all over the summer holiday and it was determined that their reading age dropped by 12 months between November 2016 and February 2017. To conclude, all students who engaged with reading over the summer, whether in digital or book form, whether they maintained their reading age or experienced some summer drop-off, were curious and self-motivated learners who enjoy reading, whatever their reading ability. Significantly, those who were summer readers all received some level of support or positive encouragement from whānau.